Byram Township, in collaboration with the New Jersey Highlands Water Protection and Planning Council, adopted an ambitious plan to establish a mixed-use town center, address its affordable-housing obligations and protect natural resources along a scenic tributary of the Musconetcong River. 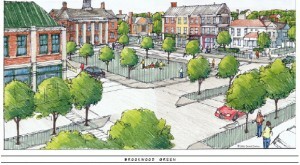 A rendering shows Byram Village Center in Byram Township. Byram is a largely rural township in Sussex County, with approximately 8,500 residents living in a 22.7-square-mile area. More than 98 percent of the township, over 14,000 acres, lies in the Highlands Preservation Area, where development is limited by the Highlands Act. The remainder of its land, some 230 acres, lies in the Highlands Planning Area. In 2002, Byram Township identified a 197-acre village center as a core development area and was awarded a center designation by the State Planning Commission. This designation, however, was set to expire in May 2010, inspiring the township to seek a new designation as a Highlands Center, in conformance with the Highlands Regional Master Plan. A reconfiguration of Byram’s Village Center shifts the development pattern toward existing developed areas, incorporates Department of Transportation safety improvements and protects critical environmental resource areas. For several months, the Highlands Council staff and township professionals worked collaboratively to fashion a plan that would enable the township to achieve its goals of revitalizing an existing developed area along its main artery, Route 206, and meeting its affordable-housing obligations while simultaneously protecting the critical natural resources identified in the Regional Master Plan. This collaborative process resulted in a reconfiguration of Byram’s Village Center to shift the development pattern toward existing developed areas, incorporate Department of Transportation safety improvements and protect critical environmental resource areas. In September 2010, after nearly 14 years of an extensive community visioning process that engaged residents, ensured ongoing citizen involvement in development/redevelopment projects and garnered the support of residents and public officials, the Highlands Council unanimously approved Byram Township’s petition for plan conformance, formally granting its designation as the first Highlands Center. 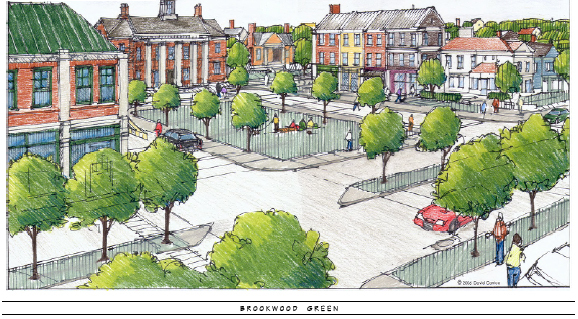 A rendering showing Brookwood Green at Byram Village Center in Byram Township. The center as designated consists of 141.4 acres for development and redevelopment and 55.6 acres of protected Highlands Environmental Resource Sites. The 31.1-acre Village Center “core” is at the heart of the plan; it will include 90,550 square feet of commercial/retail space, 39,640 square feet for civic uses and a 2.67-acre park. The residential component of the Village Center calls for 130 units (30 single-family units; 8 two-family units; 24 townhouses; and 68 apartments), including 26 units (a combination of rental and for-sale) that will be deed-restricted for low- and moderate-income households to address the township’s affordable-housing obligation. Byram is in the process of adopting the necessary zoning ordinances to help ensure the plan’s eventual implementation. The Village Center core has access to wastewater utility services via a contract agreement with the Musconetcong Sewer Authority, to provide capacity of approximately 40,000 gallons per day. It also includes the creation of a new walkable, human-scale “Main Street” via a spur off of Route 206, which will be accommodated as part of the NJ Department of Transportation’s road-widening project now underway. 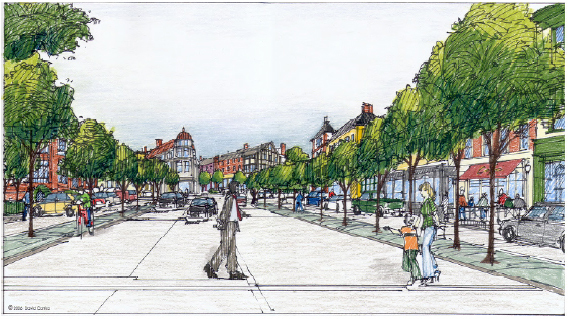 Design elements include gateway treatments at the entrances to the Center, a central plaza with benches, street lighting, tree plantings, sidewalks and paver-textured crosswalks and center median. Also included is a walking/bicycle trail component with an underpass in the new, stone-faced bridge over Lubbers Run, as part of a Greenway Project to protect this stream corridor and allow pedestrian access to the town-wide trail system. Byram Township’s Village Center plan accommodates local and regional growth and economic development while protecting the environment and water resources for future generations, serving as a model for other communities in the Highlands region and beyond.